This product is now obsolete and has been replaced by the Kane 905. 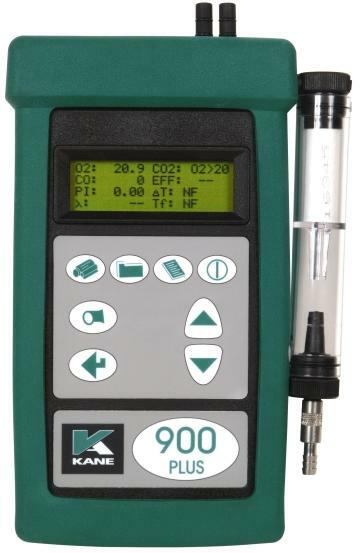 The Kane 900 Plus handheld multi-gas emissions analyser is easy to use for domestic and industrial boiler flue gas measurement and analysis. It operates on all boiler types and can display 8 parameters simultaneously showing measurements and calculations of boiler efficiency and pollution. The KM900 Plus measures O2, flue and nett temperature and calculates CO2, boiler efficiency, excess air and losses. CO is measured with a hydrogen compensated sensor for increased accuracy. It also measures CO and calculates CO/CO2 ratio - 'The Poison Index' - to give complete readings for effective boiler analysis and safety. The Kane 900 Plus measures NO and calculates NOx. Optionally, it can also measure either NO2 or SO2 and can be fitted with CO and NO sensors with different measuring ranges. These options can be fitted at time of purchase or when returned to an authorised Kane service centre at a later date. An optional pressure sensor can be fitted to measure flue draught. The KM900 Plus has a memory to store up to 150 readings and can transfer data to a printer or PC. The printout displays the time and date of each measurement as well as personalised information such as company name and telephone number. The Kane 900 Plus is supplied with a flue gas probe, protective rubber sleeve, battery charger, operators manual and carry case. This analyser uses the Kane Archiver software. This software can be downloaded, by clicking here. Kane is now known as Kane International Ltd.
You can now purchase products via our new online shop.